Use a Faraday Rotator with a polarizing beamsplitter to split the illumination and detection arms of a reflectance imaging system. See Application tab for details. Llinearly polarized light will rotate β radians after traveling through a faraday rotator over d meters when in a magnetic field with flux density B.
Faraday Rotators are ferromagnetic crystals surrounded by strong permanent magnets, which form a magneto-optic device. Linearly polarized light sent through a faraday rotator will be rotated by 45° independently of the input angle. Polarization is rotated non-reciprocally, meaning that light entering from the opposite side of the crystal will continue rotating in the same direction relative to the crystal. The rotation direction is indicated by an arrow engraved on the aluminum housing. The entrance and exit faces of our crystals are wedged approximately 1° to 2° and coated with an antireflection coating to reduce back reflections. Each Faraday rotator is designed to operate at a specific center wavelength and at ambient room temperature (approx. 22 °C); operation outside of this range will cause the output rotation angle and/or transmission to fluctuate outside of their specifications. These devices operate on the Faraday Effect, which can be quantified with the equation β = VBd. The rotation angle, β, is measure in radians, and it is defined as the product of the crystal's Verdet Constant, V; the magnetic flux density in teslas, B, along the direction of propagation; and the length of the crystal in meters, d. These variables can be seen in the diagram to the right. This effect is taken advantage of in optical isolators (see the Isolator Tutorial tab) and reflectance imaging (see the Application tab). Thorlabs offers a large selection of stocked and custom isolators for free-space and fiber-coupled applications. Please contact tech support if you require a Faraday rotator with a different rotation angle or center wavelength. Each rotator comes with an SM1CP1 and SM1CP2 end cap; both should be removed before use. Due to the powerful magnets contained in each rotator, these should be kept at least 2" away from materials or devices which can be affected or damaged by magnets. This section can be used in a reflectance imaging system to split illumination and detection arms via non-reciprocal polarization rotation. There are a number of ways to separate the illumination and detection arms of an imaging system. 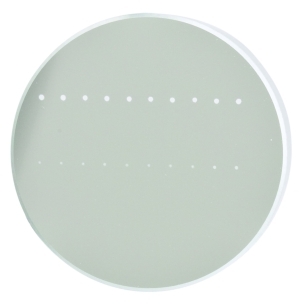 Dichroic mirrors are commonly used to split excitation and emission spectra in fluorescence microscopy. However, some applications, such as reflectance imaging techniques, require on-axis illumination and imaging with a single wavelength of light. One way to accomplish this is by taking advantage of the non-reciprocal nature of Faraday Rotators. The application photo to the right shows a section that could be used in a reflectance imaging setup. First, a beam of unpolarized 532 nm light can enter the system at the right, incident to a LPVISC100-MP2 linear polarizer. 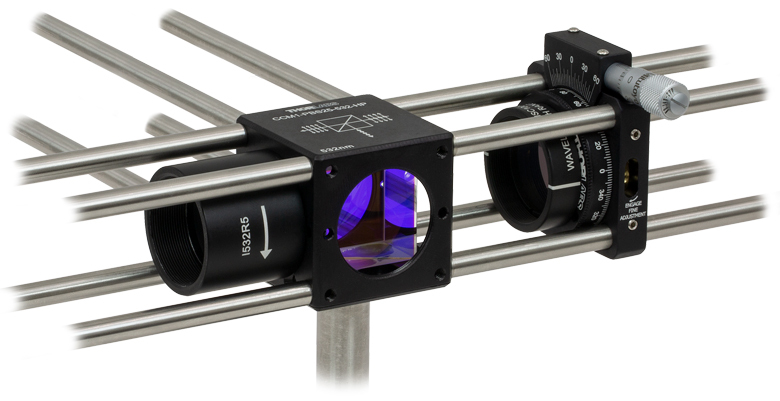 The linearly polarized light can be aligned using the CRM1P(/M) rotation mount to transmit through the CCM1-PBS25-532-HP(/M) polarizing beamsplitter cube at the center. The light's polarization state is then immediately rotated 45° by the I532R5 Faraday Rotator; the rotational alignment of the Faraday rotator is irrelevant. The light can then be sent to a scanning module or straight to an objective to the sample. The reflected light that retains the incident polarization state will continue to rotate upon reentering the Faraday rotator, making it perpendicular to its original polarization state. This light will be deflected by the polarizing beam splitter into the detection arm of your imaging system for analysis. A setup like this can be mounted directly to an optical table or incorporated into a larger DIY system with our Cerna® microscope components. A Simplified Diagram of the Setup. Reflected Beam is Offset for Illustrative Purposes Only. 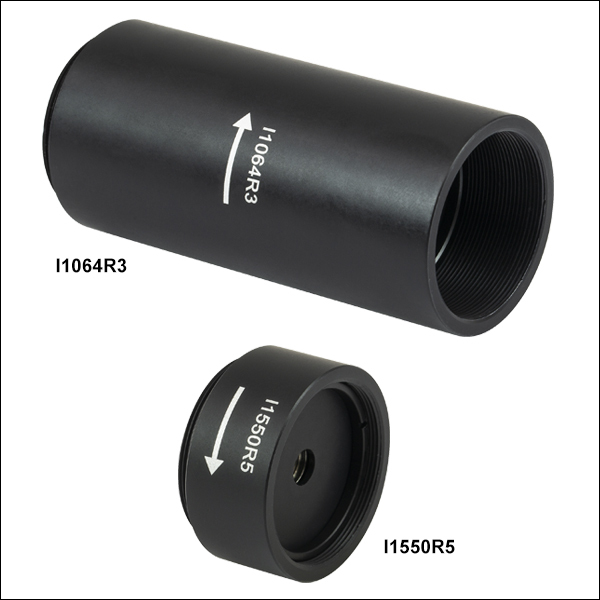 TR3 1 Ø1/2" Optical Post, SS, 8-32 Setscrew, 1/4"-20 Tap, L = 3"
An optical isolator is a passive magneto-optic device that only allows light to travel in one direction. Isolators are used to protect a source from back reflections or signals that may occur after the isolator. Back reflections can damage a laser source or cause it to mode hop, amplitude modulate, or frequency shift. In high-power applications, back reflections can cause instabilities and power spikes. An isolator's function is based on the Faraday Effect. In 1842, Michael Faraday discovered that the plane of polarized light rotates while transmitting through glass (or other materials) that is exposed to a magnetic field. The direction of rotation is dependent on the direction of the magnetic field and not on the direction of light propagation; thus, the rotation is non-reciprocal. The amount of rotation β equals V x B x d, where V, B, and d are as defined below. V: the Verdet Constant, a property of the optical material, in radians/T • m.
B: the magnetic flux density in teslas. d: the path length through the optical material in meters. An optical isolator consists of an input polarizer, a Faraday rotator with magnet, and an output polarizer. The input polarizer works as a filter to allow only linearly polarized light into the Faraday rotator. The Faraday element rotates the input light's polarization by 45°, after which it exits through another linear polarizer. The output light is now rotated by 45° with respect to the input signal. In the reverse direction, the Faraday rotator continues to rotate the light's polarization in the same direction that it did in the forward direction so that the polarization of the light is now rotated 90° with respect to the input signal. This light's polarization is now perpendicular to the transmission axis of the input polarizer, and as a result, the energy is either reflected or absorbed depending on the type of polarizer. Figure 2. A polarization-dependent isolator. Light propagating in the reverse direction is rejected by the input polarizer. In this example, we will assume that the input polarizer's axis is vertical (0° in Figure 2). Laser light, either polarized or unpolarized, enters the input polarizer and becomes vertically polarized. The Faraday rotator will rotate the plane of polarization (POP) by 45° in the positive direction. Finally, the light exits through the output polarizer which has its axis at 45°. Therefore, the light leaves the isolator with a POP of 45°. Light traveling backwards through the isolator will first enter the output polarizer, which polarizes the light at 45° with respect to the input polarizer. It then passes through the Faraday rotator rod, and the POP is rotated another 45° in the positive direction. This results in a net rotation of 90° with respect to the input polarizer, and thus, the POP is now perpendicular to the transmission axis of the input polarizer. Hence, the light will either be reflected or absorbed. Figure 3. A polarization independent isolator. Light is deflected away from the input path and stopped by the housing. In a polarization independent fiber isolator, the incoming light is split into two branches by a birefringent crystal (see Figure 3). A Faraday rotator and a half-wave plate rotate the polarization of each branch before they encounter a second birefringent crystal aligned to recombine the two beams. Back-reflected light will encounter the second birefringent crystal and be split into two beams with their polarizations aligned with the forward mode light. The faraday rotator is a non-reciprocal rotator, so it will cancel out the rotation introduced by the half wave plate for the reverse mode light. When the light encounters the input birefringent beam displacer, it will be deflected away from the collimating lens and into the walls of the isolator housing, preventing the reverse mode from entering the input fiber. With 25 years of experience and 5 U.S. patents, our isolators typically have higher transmission and isolation than other isolators, and are smaller than other units of equivalent aperture. For visible to YAG laser Isolators, Thorlabs' Faraday Rotator crystal of choice is TGG (terbium-gallium-garnet), which is unsurpassed in terms of optical quality, Verdet constant, and resistance to high laser power. Thorlabs' TGG Isolator rods have been damage tested to 22.5 J/cm2 at 1064 nm in 15 ns pulses (1.5 GW/cm2), and to 20 kW/cm2 CW. However, Thorlabs does not bear responsibility for laser power damage that is attributed to hot spots in the beam. The magnet is a major factor in determining the size and performance of an isolator. The ultimate size of the magnet is not simply determined by magnetic field strength but is also influenced by the mechanical design. Many Thorlabs magnets are not simple one piece magnets but are complex assemblies. Thorlabs' modeling systems allow optimization of the many parameters that affect size, optical path length, total rotation, and field uniformity. Thorlabs' US Patent 4,856,878 describes one such design that is used in several of the larger aperture isolators for YAG lasers. Thorlabs emphasizes that a powerful magnetic field exists around these Isolators, and thus, steel or magnetic objects should not be brought closer than 5 cm. The magnets and the Faraday rotator materials both exhibit a temperature dependence. Both the magnetic field strength and the Verdet Constant decrease with increased temperature. For operation greater than ±10 °C beyond room temperature, please contact Technical Support. Pulse broadening occurs anytime a pulse propagates through a material with an index of refraction greater than 1. 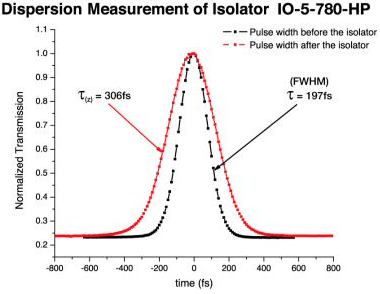 This dispersion increases inversely with the pulse width and therefore can become significant in ultrafast lasers. Thorlabs' lens tubes utilize a series of non-standard threadings. Threading specifications are given below for our SM threadings utilized in our lens tube and cage system components so that you can machine mating components to suit your application. 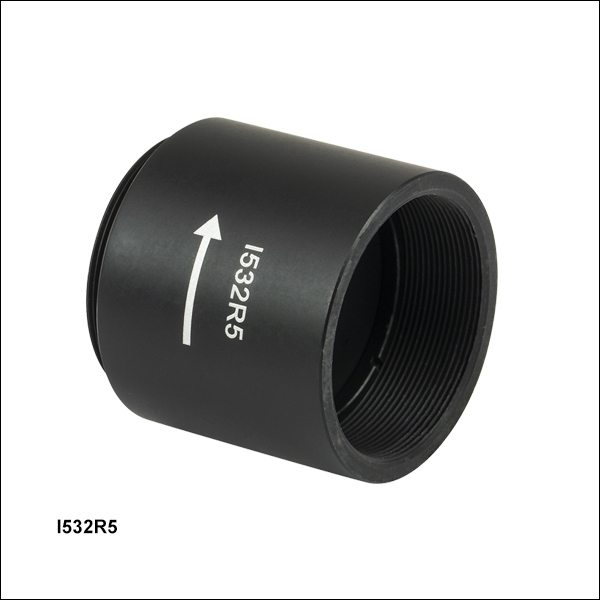 We also offer products with C-Mount and RMS threadings, and the specifications for these threadings are also given below. Please note that other manufacturers may have different tolerances for these threads. For other thread specifications that are not listed here, please contact Tech Support. Max Major Diameter 0.5340" Min Major Diameter 0.5350"
Min Major Diameter 0.5289" Min Pitch Diameter 0.5188"
Max Pitch Diameter 0.5178" Max Pitch Diameter 0.5230"
Min Pitch Diameter 0.5146" Min Minor Diameter (and 83.3% of thread) 0.508"
Max Minor Diameter 0.5069" Max Minor Diameter (and 64.9% of thread) 0.514"
Max Major Diameter 0.7989" Min Major Diameter 0.8000"
Min Major Diameter 0.7934" Min Pitch Diameter 0.7820"
Max Pitch Diameter 0.7809" Max Pitch Diameter 0.7866"
Min Pitch Diameter 0.7774" Min Minor Diameter (and 83.3% of thread) 0.770"
Max Minor Diameter 0.7688" Max Minor Diameter (and 64.9% of thread) 0.777"
Max Major Diameter 0.9989" Min Major Diameter 1.0000"
Min Major Diameter 0.9929" Min Pitch Diameter 0.9797"
Max Pitch Diameter 0.9786" Max Pitch Diameter 0.9846"
Min Pitch Diameter 0.9748" Min Minor Diameter (and 83.3% of thread) 0.966"
Max Minor Diameter 0.9651" Max Minor Diameter (and 64.9% of thread) 0.974"
Max Major Diameter 1.0339" Min Major Diameter 1.0350"
Min Major Diameter 1.0288" Min Pitch Diameter 1.0188"
Max Pitch Diameter 1.0177" Max Pitch Diameter 1.0234"
Min Pitch Diameter 1.0142" Min Minor Diameter (and 83.3% of thread) 1.008"
Max Minor Diameter 1.0068" Max Minor Diameter (and 64.9% of thread) 1.014"
Max Major Diameter 2.0338" Min Major Diameter 2.0350"
Min Major Diameter 2.0287" Min Pitch Diameter 2.0188"
Max Pitch Diameter 2.0176" Max Pitch Diameter 2.0239"
Min Pitch Diameter 2.0137" Min Minor Diameter (and 83.3% of thread) 2.008"
Max Minor Diameter 2.0067" Max Minor Diameter (and 64.9% of thread) 2.014"
Max Major Diameter 3.0337" Min Major Diameter 3.0350"
Min Major Diameter 3.0286" Min Pitch Diameter 3.0188"
Max Pitch Diameter 3.0175" Max Pitch Diameter 3.0242"
Min Pitch Diameter 3.0133" Min Minor Diameter (and 83.3% of thread) 3.008"
Max Minor Diameter 3.0066" Max Minor Diameter (and 64.9% of thread) 3.014"
The specifications to the right are measured data for Thorlabs' Faraday Rotators. The power density of your beam should be calculated in terms of W/cm. For an explanation of why the linear power density provides the best metric for long pulse and CW sources, please see below. 150 MW/cm2 (Pulsed) Ø1.20" x 1.15"
These values are specified at the rotator's center wavelength when operating between 21 °C and 23 °C. 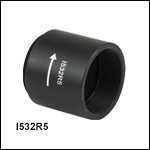 150 MW/cm2 (Pulsed) Ø1.20" x 1.65"
150 MW/cm2 (Pulsed) Ø1.20" x 2.65"
I1550R5 1550 nm 1500 - 1600 nm 5.0 mm 45° ± 1° 98% 4.7 mm 15 W 92.3 W/cm (CW) Ø1.20" x 0.65"